This post comes to you from within the lovin' bosom of Chateau VVB itself: yes, we're back home in the leafy western suburbs of Brisvegas for a few days. It's evident that the new job and amount of travelling it demands (Barcaldine last week, Townsville this past week, now Brisbane ) means that for a while at least, blogging will be sporadic. This weekend is devoted to helping fix up the Chateau for sale, which means today we were in a shop whose name is not unlike "runnings" and where you can't get decent help no matter what you do. So a request for assistance with the correct bag for the lawn vacuum was met with "you may as well buy a new machine, those bags are so expensive." Well I knew that already, even though the price came down from $56 (yes, $56 for a consumable!) to $38, they still only last a month or so. What I needed was help to translate the previous part number into the new one, because the packaging was quite different. Which explains how I came to back there late afternoon trying to exchange this morning's guess for the correct one. But that seemed to be a request too far. And so that's also how I came to be in the 'refund/exchange' line later this afternoon, behind bogans who use it as a quicker way than the main checkouts. Bogans who don't look after their kids while they carry on and show off to their mates. So the kid begins to wail that he's lost his daddy. Now, blokes my age can no longer help little lost boys in shops and supermarkets lest some misguided zealot, or bogan father perhaps, makes an unwarranted deduction. Anyway today a nice young Indian girl pointed the youngster back to his dad who immediately abused him for wandering off and then accused him of being "mental". Nice. About a year ago the wonders of the internet brought me an inquiry from the UK about a car I had owned when I was still at school. Having googled "Morris Isis", my interlocutor came across this post and left a comment on a later blog, asking me to contact him. Which I did. 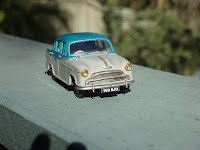 And it turns out that not only is he a Morris Isis obsessive, but he owns the actual car from which my model, as shown in the post, was copied. Here it is on the right. The model didn't get the length of the bonnet correct - the Isis had a 6 cylinder motor and a mighty long bonnet to put it under. He asked me to write up a longer version of my post, which I did some months ago and this week a copy arrived of Quality First: The magazine of the Morris Cowley, Oxford and Isis owners club with my piece in it. It's titled It's a small world and indeed it is. So life still provides plenty of opportunity for comment along the way, but I fear that somewhat less of it will be coming from Chateau VVB until Mrs VVB and I are comfortably established in RARA land. We've got to a shortlist of houses we like, we're organising the bank finance (eeeeurrgh interest rates) and as mentioned earlier we're trying to get Chateau VVB into saleable condition. It's a bugger of a plave to keep clean inside and outside and so there's a lot of work to be done to make it presentable. Along with the move I have to sell the current motor, this one. A long way from the Isis, yes? And does anyone want an acoustic electric Maton 12 string, by any chance? Just when you think life can't get any more...well weird doesn't quite do it, but 'wrong' kind of sums it up... you get a story like this (sorry, I am going to make you click the link, no easy passes here at Chateau VVB). And you realise that having lots more choices about what you can do with your life doesn't really enrich it. Nor for your nearest and dearest. I'm not in Chateau VVB nor even pied a terre VVB, I'm currently in Townsville, I just don't seem to stand still any more. To badly paraphrase ZZ Top: I'm RARA, I'm nationwide. Been everywhere? Not quite, but I'm working on it. But I've been to Barcaldine - well in fact I'm still here - and, in pursuance of the blogcredo about a decent espresso being the signifier of civilisation, I can now report that you can get a perfectly acceptable flat white here. Along with a nice big piece of well buttered toast. A perfect breakfast in other words, which I had this morning and hope to have again tomorrow. Cool mornings, brillant days, cool evenings (well at this time of year anyway). A radiant night sky all full of stars. Answers on a piece of box wood suitable for making a didgeridoo, c/- middle of the road, Barcaldine. They don't have the Tree of Knowledge any more, but you can see where it used to be. "I have some issues around that..."
"We've been doing some work around..."
"Can I suggest that we talk around..."
"We need to focus around..."
Just a quick update to why this corner of the universe has been quiet of late: teeth. Specifically, unbearable shooting nerve pain over 4 days which antibiotics, Nurofen Extra, Panadeine Forte and a short piece of dentistry couldn't right. The Panadeine Forte almost got me there - the nice pharmacist said "you do realise it'll make you drowsy?" to which I replied "that's the general idea", but as the drowsiness overwhelmed me, the nerve pain shot through again like a bloody great butcher's knife. Two nights in a row wide awake, sipping iced water to dull the pain, lie down for 2 minutes, sip and swill again, etc etc etc. Three a.m. on Wednesday morning the iced water stopped working. I had 4 Panadeine Fortes in me and, basically, there was nowhere to go whether physically, pharmaceutically or mentally. Got on a plane home, saw my own dentist who, knowing my history, diagnosed correctly and started the road to recovery. It's nice to be functional again, I can tell you. One of the things that Mrs VVB and I have been considering, as we make this move to Rural and Regional Australia (capitals intended), is the availability of infrastructure to support us into our next decade. So far, that is to say based on this single example, it's come up a little short so far. But that's not to say that there aren't suitable services once I know the area better. The dentist I saw seemed perfectly competent and came with a number of recommendations, but he didn't know my clinical history and I presented him with a complex problem. He did the standard checks, he did the best he could on the knowledge he had. And best of all, he was honest with me as we tried to work out what was going on. Including noting that the anasthetic he gave me would buy me a few hours' peace. It did, he gave me three hours' sleep in three days. But the availability of infrastructure and support services is a big issue in Sea Changing (capitals intended). The Sea Change has a lot of other elements including real estate agents, terms and conditions of employment, builders, and adult children residing at home, but they are all stories for another day. As a sort of meta-comment, I know writing all about me and the personal doings of Chateau VVB is probably pretty basic blogging. You may be interested, most likely you won't. But knowing who my regular readers are now, and adhering to some good advice I once got (from a bloke I ran across today for the first time in a long time): "don't underestimate the value of a bloody good story, well told." Well we mightn't have quite reached those lofty heights yet but I do try to add a little commentary to the daily doings. And, surprise to say, I find this somewhat more rewarding, or at least less demeaning, than ranting about the former government and its despicable leader. Although you can see how quickly one can relapse. Was that "despicable" really necessary? Or is there a more suitable word? Answers on the back of a Liberal party sanctioned piece of electoral bastardry to Chateau VVB, in transit, Queensland. You all know that I'm a big Jeremy Clarkson fan, but some weeks you go to the Times of LOndon and discover he's got the week off to conduct a mock crucifixion of Tony Blair, or to shoot ecologists. On those days, you scout around the website and you might run across AA Gill. Gill does to poor restaurants what Clarkson does to Mercedes Benzes and Vauxhalls. So it's by-the-numbers sarcasm dripping with bons mots and just happens to be excruciatingly funny, if you like the same humour as me. I think all professions should do this, except gynaecologists. Those of you who are so intrigued by the brilliance regularly on show at Chateau VVB, or possibly with far too much time on your hands, may have visited the 'about me' profile summary. In there, you would have found a short list of 10% or my favourite bands, including 'one hit wonders'. I included this as a shorthand way of not listing a whole heap of songs I really like, such as I fought the law and Turning Japanese. Anyway, fast forward to yesterday arvo at the shops and I'm in Sanity, as there isn't a JB Hi Fi within cooee of here, being as we are in RARA land. So I'm fossicking about and find a compilation of One Hit Wonders. Wow, I feel myself demographically targetted and bingo, by Jove the marketers have got me right where it counts! So, they've got this compilation and it's got 2 CDs and a DVD and it includes some really nice stuff, by my lights: Kajagoogoo (Too Shy), Paul Norton (Stuck on You), James Freud (Modern Girl), Dream Machine (Life in a Northern Town) and so you go. Nice to have the DVD, it would take me back except we were overseas when a lot of this stuff came out and never saw the videos on TV. The nice young lady comes over and asks can she help and I say "do you really get 2 CDs and a DVD for only $24.95? What a bargain!" and she replies in the affirmative. However, when we look at the CD and DVD we see Owner of a Lonely Heart, by Yes. Now I have to take exception to categorising Yes as one hit wonders. Certainly, Owner of a Lonely Heart was late in their time after several personnel changes, it sounded different to a lot of their other stuff and in particular it featured words that made reasonable sense as written. But one hit wonders? Never. What about Yours is no disgrace, Starship Trooper, Roundabout to name but a few? It's been a week since I posted. I've been busy, I've been ill, I've been all over the shop. Lack of consistent posting is death in the 'sphere, I believe I read somewhere. Well, that's it then. I'm dog-tired, I have multiple toothache, I have nothing even remotely interesting to comment on.